We used this flannel song in our Bears and Berries storytime. This storytime activity uses repetition, number sequencing, and would work well in a storytime on summer, food, or berries. It is based on the book Jamberry by Bruce Degen. These flannel pieces were easy to make. All we did was draft a canoe shape and five different coloured berries. 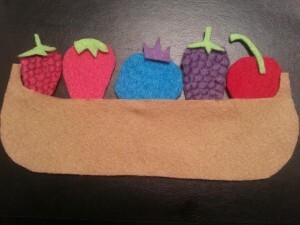 Feel free to use berries from other flannel stories you have laying around. It was quite nice to have the berries as a visual cue on the flannel board that we could refer to throughout the storytime. Here’s a video showing how we used the felt pieces as a flannel song. Under the bridge and over the dam, looking for berries, berries for jam. 9, berries, 10 berries, pick me a raspberry. For the full Flannel Friday round up this week, check out Kathryn’s blog Fun With Friends at Storytime. For more Flannel Friday ideas, click on the Flannel Button in our sidebar. This 30-minute storytime has been adapted from one I learned from Allison Taylor McBryde in my Children’s Services courses. You can hear all of the songs and rhymes by clicking on the Watch Here links. 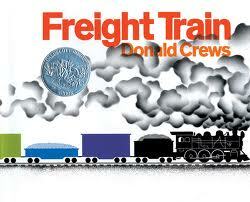 For more transportation storytime ideas, check out our Pinterest board! 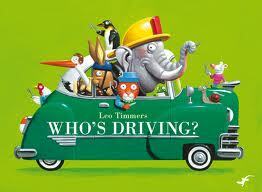 Who is Driving? is a highly interactive story that helps kids learn to make inferences. I did this one first, but it could have easily come last because it kept the kids engaged the whole time. 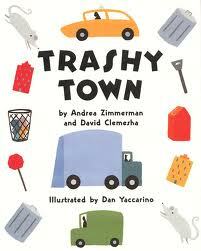 When I do Trashy Town, I teach everyone three hand movements that match the refrain in the book: dump it in, smash it down, drive around the trashy town. It’s a great way to emphasize the repetition and get the kids involved. 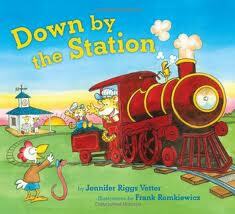 I sing Down by the Station to the tune of Little Bunny Foo Foo. Lastly, I did Freight Train as a felt story. I don’t have the pattern to share, but you can find it here with lots of good early literacy tips as well. I’m in the mood for singing. Hey, how about you? I’m in the mood for singing, singing along with you. Hey, hey, what do you say? I’m in the mood for that today. Hey, hey, what do you say? I’m in the mood for that. In 5, 4, 3, 2, 1,,, Blast off! This song is an African American spiritual. I have the kids sway side to side and then lift their arms (or their whole bodies) when the waves are high. 4. Song: Have You Ever Seen A Sailboat? Watch the video to see the sign language demonstrated. We all must obey them, even the queen. The books were such a hit! Three out of the four were very interactive and I think that helped keep the attention of the 2-year-olds who tagged along with their older siblings. When signing I’m Sitting in a Boat, I mentioned that the rhythm of the song would make a great lullaby or bedtime song for any age group. If I could do it again, I would introduce the sign language stop light rhyme at the beginning of the storytime and then again at the end to reinforce the signs.